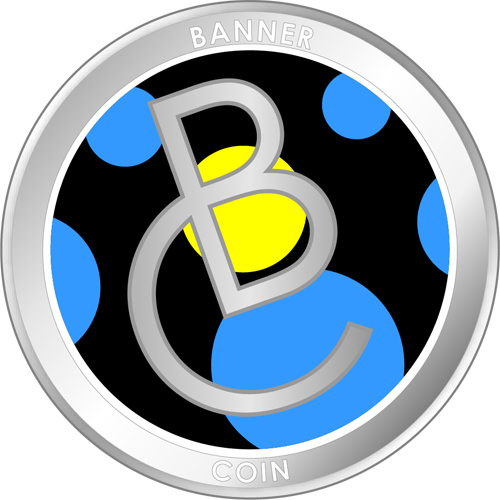 BannerCoin (BCOIN) is the official digital currency asset created by BannerView.com, the developers of the BannerOS website management platform. BannerCoin is an ERC20 token which means it runs on top of the Ethereum network. Holders of the token can trade it or redeem it with BannerView.com for service credits that can be used toward BannerOS and BannerGrips addons. BannerCoins are in limited supply. A total maximum supply of only 100,000,000 were created and no more can be added or mined. 11/26/18: Direct purchases of BannerCoin have ended. You may still be able to obtain them via exchanges like Ether and ForkDelta. 01/24/18: BannerCoin can be traded on ForkDelta - an alternative interface to EtherDelta. 12/12/17: BannerCoin covered in HuffPo article! 11/27/17: Vertcoin support has been added to the BannerCoin project. VTC payment acceptance can be seen in action in the BannerView.com Website Marketing store and it's also accepted for BannerCoin purchases. 11/14/17: Peercoin support has been added to the BannerCoin project. PPC payment acceptance can be seen in action in the BannerView.com Website Marketing store and it's also accepted for BannerCoin purchases. BannerCoin, symbol: BCOIN is now officially listed on EtherDelta. Trading has started close to 50% higher than the ICO price! The BannerCoin ICO sale came to a close on November 1, 2017. We appreciate all the support and participation in the sale. The BannerCoin project allows merchants to accept both cryptocurrency and credit/debit card payments together directly from their website. The project's goal is to increase the number of merchants who accept and use digital currencies by reducing the friction of configuring websites to accept both credit card and crypto payments. The development of BannerCharge 3.0 will enable merchants to accept digital currency payments in addition to credit card payments. Initially 8 digital currencies including BannerCoin, Bitcoin, Dash, Ethereum, Litecoin, Monero, Ripple, and Zcash can be accepted by merchants. Merchants will have full control over which currencies they choose to accept, however, the acceptance of at least BannerCoin will be required upon enabling this feature. We estimate that about every two weeks after BannerCharge 3.0 is released, we'll be able to add support for another digital currency. Each time a new currency is added, it will improve the ecosystem for that currency. The BannerCoin token is a cryptocurrency used with BannerCharge that can be redeemed for BannerView.com service credits. All BannerOS customers who use BannerCharge to accept payments via digital currencies will be required to accept the BannerCoin token as a form of payment. There could be a growing market of merchants accepting it for actual goods and services. Each BannerCoin token will be redeemable for one (1) BannerView.com credit. These credits can then be used toward recurring services provided by BannerView.com limited to website hosting and BannerOS related license fees including BannerGrips that are billed on a monthly or other recurring basis at a rate of 1 credit per $1 value of service purchased. BannerCoin is an Ethereum blockchain token based upon the ERC20 standard. Token Contract Address: 0xd3e2f9dfff5a6feeece5dbcee3b86cb375fd8c98 DO NOT SEND ETH TO THIS ADDRESS! 100,000,000 BannerCoin tokens have been created. This a hard cap. Additional coins can't be created. This is not a sale of securities, or offer of sale of securities. There are no voting rights or other implied rights by participating in this initial coin offering. By purchasing BannerCoin tokens, you are becoming a customer of BannerView.com and purchasing a redeemable token. Each token is redeemable for one (1) BannerView.com credit. BannerView.com credits can be used toward recurring services provided by BannerView.com limited to website hosting and BannerOS related license fees including BannerGrips that are billed on a monthly or other recurring basis at a rate of 1 credit per $1 value of service purchased. There is no other assigned or implied cash value beyond the tokens being redeemable for BannerView.com credits. While BannerView.com may, in the future, make purchases of BannerCoin tokens on the open market, it is under no obligation to purchase BannerCoin tokens for cash consideration. ALL SALES of BannerCoin tokens are FINAL. No refunds will be issued! BannerView.com makes no restrictions on the transferability of BannerCoin tokens. They can be traded, sold or otherwise transferred as seen fit as you would any digital property under the laws of your local jurisdiction. This includes being exchanged for other cryptographic property, or for goods and services at those merchants who decide to accept BannerCoin tokens as a form of payment or trade. Those wishing to redeem BannerCoin tokens for BannerView.com credits will be required to register as a customer with BannerView.com prior to redemption. We only allow token redemptions from customers with whom we can legally conduct business. There are no guarantees that a market for BannerCoin tokens will develop nor are there guarantees merchants will adopt the acceptance of digital currencies, including BannerCoin tokens. Once BannerCoin tokens are in your possession, BannerView.com has no control over what you do with the tokens. In the event of theft or loss of BannerCoin tokens, BannerView.com offers no legal liability to refund or retrieve such tokens. Once tokens are moved from one wallet to another, there's no technical ability to reverse a transaction. All transactions of BannerCoin tokens are irreversible. Treat your BannerCoins like you would your physical wallet! BannerCoin is an Ethereum ERC20 token which means it’s required that people wishing to hold the token have an Ethereum wallet in which to receive the token. https://metamask.io - Metamast is available as a chrome plugin. It’s a lightweight wallet meaning you don’t have to download the entire Ethereum blockchain in order to access your funds. Once you’ve added the contract address, you’ll see the balance of your BCOINs. It’s safe to have your coins sent to our Ethereum address even if you haven’t added the contract address to your wallet.